Ring 3 light rail is a 27km-long proposed light rail project in the city of Copenhagen. Image courtesy of Ringbyletbanesamarbejdet. The light rail project will extend between Ishoj town in south and Lundtofte town in north. Image courtesy of Ringbyletbanesamarbejdet. The Ministry of Transport, the Capital Region of Denmark and 11 municipalities in the Copenhagen area signed an agreement to build the light rail in 2013. Image courtesy of Ringbyletbanesamarbejdet. The Finger Plan is an urban development plan for Copenhagen metropolitan area. Image courtesy of Ringbyletbanesamarbejdet. The light rail will run along the Ring 3 Motorway Road and replace bus service 300S. Image courtesy of Ringbyletbanesamarbejdet. The Ring 3 light rail route will include 27 stations. Image courtesy of Ringbyletbanesamarbejdet. The light rail will end at Ishoj town in south. Image courtesy of Ringbyletbanesamarbejdet. 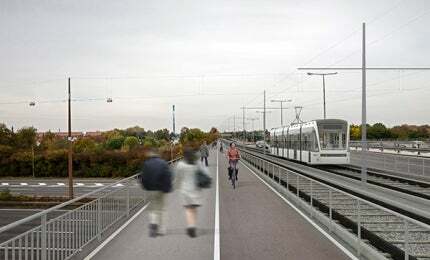 The Ring 3 is a proposed light rail project in the Greater Copenhagen area, Denmark. The dual-track light rail line will run along the Ring 3 Motorway Road from Ishoj town in the south to Lundtofte town in the north. It is the biggest light rail project in Denmark, as well as in all the five Nordic countries. Ring 3 Light rail I/S (Ring 3 Letbane I/S), a company was established by the Danish Ministry of Transport, the Capital Region of Denmark and 11 municipalities in the Greater Copenhagen area, is responsible for the design, construction and operation of the project. Trains on the new light rail line will travel an average speed of 30km/h covering the 27km stretch in 55 minutes, and at a maximum speed of 70km/h. The line is expected to carry 43,000 passengers a day and up to 14 million passengers a year. The total investment for the project is estimated to be kr4.4bn ($673m). Construction is scheduled to begin in 2016 and services will open to public by 2020. The project is expected to generate 7,000 direct and indirect full-time jobs during construction and 250 permanent jobs upon commissioning. It is further expected to create up to 20,000 jobs in urban areas near the new stations until 2032. The city of Copenhagen implemented an urban development plan known as the Finger Plan in 1947. It focused on developing the cities around Copenhagen, in addition to the five fingers extending from the dense urban area (palm) of central Copenhagen. "Construction is scheduled to begin in 2016 and services will open to public by 2020." Studies have shown that more number of people will move to these cities in the near future. It calls for a transport system along and between these fingers. The proposed light rail addresses the situation by running across all the five fingers outside Copenhagen and linking a number of lines in the existing radial S-train urban rail network. The new rail route will include 27km of double track alignment with 27 stations. It will start from Lundtofte station in the north and follow the route of the Ring 3 Motorway Road, touching municipalities including Lyngby-Taarbæk, Gladsaxe, Herlev, Rødovre, Glostrup, Albertslund, Brondby, Vallensbaek, to finally reach Ishoj in the south. The trains will stop at six S-train stations, one intercity station, two hospitals and the Technical University of Denmark. The stations will be approximately 1km apart. The light rail will be integrated into the road system and run parallel to the existing roads. It will receive power from overhead wires suspended from masts. The rolling stock will comprise 27 light rail vehicles, which are 65m-wide, 3.5m-high and 35m-long, and have a capacity of up to 230 passengers each. The construction of light rail at Ring 3 is scheduled to be executed in four phases over a period of eight years. Phase I included the programme study, which was followed by a principle agreement between the state, Capital Region of Denmark and the 11 municipalities in 2013 to establish a light rail. Phase II includes legal basis, environmental impact assessment (EIA), tender and contracts, and preparatory works. Ot is expected to take approximately three years, following which a final decision will be taken regarding the construction of the project. Phase III includes the construction of the light rail, testing and mobilisation, and preparation for passenger operations. It is scheduled for completion in four years. Phase IV involves the completion of preparations for passenger operations. Ring 3 Light Rail I/S has selected four teams of consultants for the execution of the project. A team comprising COWI, Parsons Brinckerhoff, NIRAS, SYSTRA and Tetra Plan will be responsible for roads, bridges, utility relocations and other preparatory works. Ramboll Denmark will be responsible for the preparation of the EIA report and the associated technical assessments. The first light rail project in Denmark, Aarhus Light Rail Project has been under construction since 2013. The joint venture of Ramboll Denmark and Arup was contracted to prepare the conceptual design and subsequent tender for the rail infrastructure, rolling stock, maintenance centre and operation and maintenance of the plant. Designit, TTK and Mott MacDonald are the subcontractors for the project. A team consisting of Gottlieb Paludan Architects and subconsultants GBH Landscape Architects, Kontrapunkt and COWI will be responsible for station design and landscape integration. The Copenhagen Ring 3 light rail project is being jointly commissioned by 13 owners, who formed Ring 3 Light rail I/S. The project cost is divided between the 13 parties. The total estimated investment for the project is kr4.4bn ($673m) at 2013 prices, including a correction reserve of 15%. In addition, kr1.3bn ($198m) is estimated for operation and maintenance costs. While the state’s contribution is 40%, the municipalities will contribute 34% and the Capital Region of Denmark will contribute 26% towards the project.